Wayman Tisdale was another ‘shining star’ who was ‘gone too soon.’ Although an extremely talented former professional basketball player, Tisdale was equally talented as a multi-instrumentalist, who focused on the bass for the most part. Sadly, in May 2009, Wayman died after a stint with cancer. What did not die was Tisdale’s legacy. Experimental project The Fonk Record (featuring Tiz & The Fonkie Planetarians) is an album that showcases Tisdale’s restless creativity as a musician. Here, “Tiz” (as he calls himself in the CD jacket) shows his multiple instrumental talents and leaves his fans with a solid, posthumous effort. “Tiz” covers vocals, guitars, bass guitars, and synthesizers throughout this eleven-song set and there are no duds in the least. While there are times when the funk grows the slightest bit too indulgent, there is little to quibble about here. “The Introduction” is the first signal of Tisdale’s experimental, ‘funky’ direction. Wayman opens up with a spoken word segment (by himself) and then well mixed, soulful background vocals take over a catchy hook. While the track is ‘an introduction,’ it clocks in over three minutes and is actually worthy of a couple or repeat listens. The real ‘heat’ comes with “Let’s Ride,” featuring jazz legend George Duke lending his synthesizer chops. Here, “Tiz” covers vocals, bass and guitars, once again shocking listeners with his superb imitations of the great funk vocalists that captivated listeners back when including Sly of Sly & The Family Stone and George Clinton of Parliament, Funkadelic fame. “Let’s Ride” is a great cut and there is next-to-nothing to object to at this point. “This Fonk is 4U” features George Clinton, mostly in spoken-word capacity. Again, Tisdale provides a sound, nuanced vocal performance. The production work is superb here, with superb funk guitar playing from Perry Hardin and an addictive drum groove from Arthur Thompson. “This Fonk Is 4U” features one too many musical ideas perhaps, but it is by no means merely filler. “Spread Tha Butta” is another creative cut, using an array of sounds. There are some nice vocal moments by Wayman here as always and the background vocals just enhance the soulful ambiance. The only drawback is the excessive length, given the repetitions of the funk ideas throughout this cut. An interlude follows (“Tiz Phone Call”), finding Tisdale alluding to the 1970s (“bell bottoms,” etc.). “Sunshine” is the valedictory moment of the album – the best and perhaps most developed cut. Here, Tisdale slows the tempo down and lets his soulfulness unfurl. The orchestration is perfect here with a nice use of horns, great bass playing by Derek “DOA” Allen, and smart use of synthesizer. Tisdale steals the show vocally, showing he is much more than just a superb bassist (and did I mention former pro-basketball player?). And Lets not forget about that “space bass” solo. Good stuff. “Neck Bones” contrasts the slow tempo of “Sunshine” in favor of the‘restoration’ of the funk. As always, the production work is great with great playing by all musicians here. “Tiz” throws in another ‘space bass’ solo as well. “Neck Bones” is solid and enjoyable, but does not live up to the greatness of “Sunshine.” “If U Really Want To Know (I Like It Fonk-kaa)” is another contrast, finding ‘The Fonkie Planetarians’ playing mid-tempo this time around. Here, Tisdale finally shows off his superb bass skills. It makes the listener wish that he had accentuated his bass playing more on this album. “Every Now and Then” is solid, but feels like a rewrite of other better funk-driven cuts (“Let’s Ride” being the prime example). “Been Here Before,” featuring soulful vocalist Ollie Woodson is “Sunshine’s” counterpart, providing one of the album’s other standout moments. The tempo is slower and ‘grinding’ in quality, allowing the soulful factor to be heightened infinitely. Gospel and soul ooze out of this extraordinary cut and it is easy to see why Ollie Woodson was so inspired to achieve the soul grit he does here. 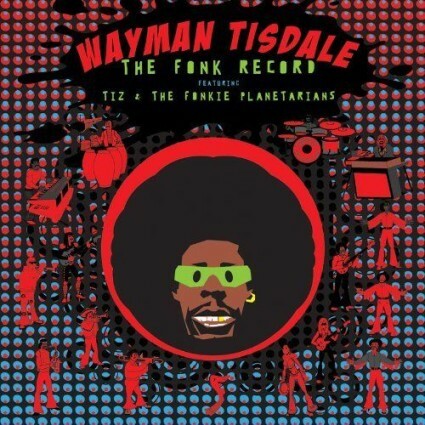 Closing cut “Wayman’s Gotta Do It” features a vocoder (another left-of-center creative turn by Tisdale), which is in itself a reason to discuss this cut. Here, Tisdale closes the album showing off his superb musicianship as a bassist while Derek “DOA” Allen handles Moog Bass duties. The cut is not the standout of the album, but it is a solid, enjoyable, and above par way to end a great effort such as this. In conclusion, Tisdale has left use with a gem. His memory will live on forever through his his music and through his many accomplishments as professional basketball player. This album is a special one that showcases virtuous musicianship perfectly.